A recipe for the best, Christmas Sugar Cookies with Sugar Cookie Icing, featuring homemade sugar cookies and an easy buttercream frosting. 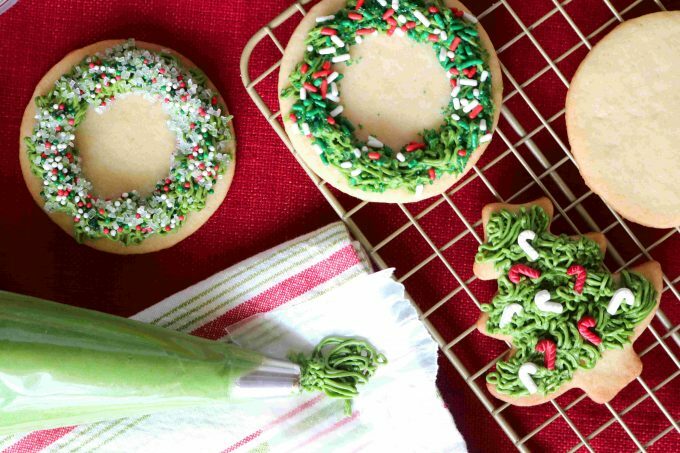 Plus, how to ice tree and wreath cookies to look like grass. A good sugar cookie is hard to come by. I’ve tried my fair share of both store-bought and homemade, and sadly I must report the majority have been lackluster and of one note. That note is sweet — all sugar and not much else. I guess you could say those old timers are just living up to their name. They are sugar cookies after all. But, if you ask me, we can do better. Actually, we can do way better. You can take a sugar cookie from “just ok” to incredible with just two secret ingredients: almond extract and salt. Just about all sugar cookie recipes contain vanilla extract, but it’s the addition of almond extract that adds a great deal more flavor, elevating these sugar cookies far above their humdrum predecessors. Salt is such an important ingredient when it comes to baked goods, especially those containing vast amounts of sugar. Recipes like, let’s say, sugar cookies. Salt not only balances the sweetness of the cookie, but it helps to enhance the other ingredients as well. This sugar cookie recipe was adapted from The Art of the Cookie, and I can say without hesitation, this is going to be the best sugar cookie you’ve ever made and the very best you’ve ever eaten. The dough is simple to throw together, and easy to work with. Now that we’ve got the cookie base ready to go, it’s time to move on to the good stuff — the Sugar Cookie Icing. Hands-down, the best tasting sugar cookie icing is none other than a homemade buttercream frosting. However, same as before, icing for sugar cookies can be super boring if that buttercream frosting is sweet, and nothing but sweet. Bleh. So how do we fix it? I bet you can guess. If you thought extract and salt, you thought right! We should celebrate by baking cookies. Adding vanilla extract and salt to icing for cookies will take it from good to great in less than 30 seconds. And, if you were to try a before and after, you would undoubtedly taste the difference. There are multiple types of icing for cookies: a standard buttercream frosting, a shortening-based icing, and royal icing. You can get the how-to on royal icing here. For these cookies, we will be working with a buttercream frosting. To start things off, the most important thing is to make sure your butter is at room temperature before you begin. Set out your butter the night before you intend to make the cookies. The butter should be very soft, but not melty. The butter goes into the bowl of a stand mixer, or a mixing bowl, and in goes the sugar and salt. Begin mixing on low (to keep that sugar from flying all over the kitchen), then as the sugar is absorbed into the butter, begin increasing the speed to medium-high until the mixture is perfectly smooth. Add this point the extract is mixed in, and that is all there is to making a homemade buttercream frosting for sugar cookies. You can ice sugar cookies many different ways. The easiest being to simply spoon a tablespoon of Sugar Cookie Icing in the center of the cookie and smear it to the edges using a small, offset spatula. However, if you want to get fancy, it’s time to pull out the pastry bag and tips. Using a pair of scissors, snip away the pointed part of the pastry bag, about a 1/2″ from the bottom. Place tip in the bag and fold over the edges, about 2 1/2″ from the opening of the bag. Scoop in Sugar Cookie Icing, and tightly twist where the icing ends. Use one hand to steer the tip, and one to gently apply pressure. Squeeze at the twist to release the icing. Try practicing on a sheet of wax paper before you begin. I found a pretty good visual tutorial for you here. I prefer gel food coloring found at specialty craft stores, as it is more vivid and requires less product than the liquid food coloring. However, the liquid icing works fine for this recipe as well. If you want to use multiple colors for icing sugar cookies, you will first need to divide the Sugar Cookie Icing into separate bowls. Then, add the food coloring in small increments, and mix well after each addition, until you have reached the desired color. The tip you’ll need for making grass is Wilton Tip #234. You can find this tip at just about any specialty craft store, and of course, online, for less than $2.00. To make the grass, squeeze the bag and allow a small amount of the Sugar Cookie Icing to release onto the cookie. Stop the pressure, and pull the pastry bag away from the cookie. Repeat until the cookie is completely iced. Have sprinkles handy for decorating as the icing will set fairly quickly. A beautiful cookie that actually tastes great. Now that is a win-win in the kitchen. Whether making this cookie at home as a quality-time activity for you and the kids or an addition to this year’s Christmas party menu, this recipe could do you no wrong. Even more so if you are giving them as a homemade Christmas gift this year. These sugar cookies are legit the best tasting iced sugar cookies in the entire world. Homemade gifts don’t get much better or more sincere than this. To take the time to create something spectacular for loved ones is heartfelt and gracious, and your recipients will be over-the-top merry to receive these cookies. Please, enjoy. Royally Iced Sugar Cookies are beautiful and perfect for gifting as they can be stacked and easily transported. This recipe makes easy work of making royal icing, along with detailed tips for icing your cookies. Painted Sugar Cookies with Royal Icing are fun and easy to decorate. Pull out the paint brushes and get creative with these sweet (and beautiful) treats! Egg Hunt Blondies are an adorable Easter dessert featuring a homemade buttercream frosting made to look like Easter grass and M&M candies made to look like eggs for an egg hunt! Homemade Brownies with Strawberry Cream Cheese Icing and Fresh Berries features a light-as-air, whipped strawberry cream cheese frosting, topped with an assortment of beautiful berries. This dessert makes a seriously impressive presentation! Halloween Sugar Cookies will show the secret to making your cookies look as though they are suspended in air! 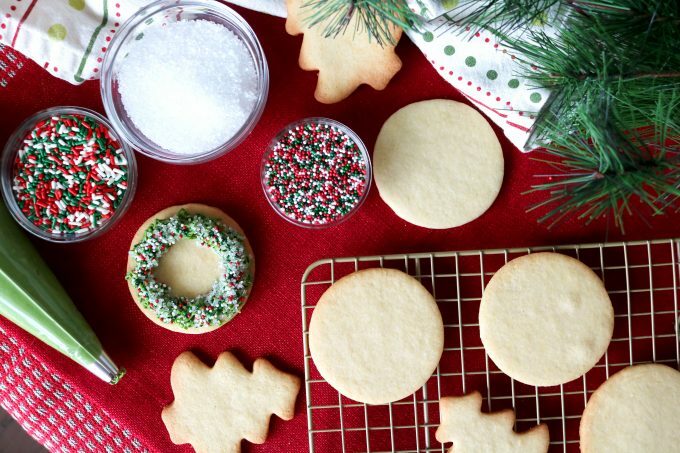 Yes, hanging sugar cookies is a real thing, and they’re easier to make than you think! This can be applied to bats and ghosts for Halloween, as well as ornament, shaped sugar cookies with Christmas. A recipe for the best, iced Christmas cookies, featuring homemade sugar cookies and an easy buttercream frosting. In a mixing bowl, whisk together flour, baking powder and salt. Set aside until ready to use. In the bowl of a stand mixer fitted with a paddle attachment, beat the butter on medium-high speed for 1-2 minutes. Alternatively, use a large mixing bowl and a handheld mixer. Add the sugar and beat on medium-high speed once again until light and fluffy, about 3 minutes. Scrape down the sides of the bowl and mix briefly once again. Add the egg and mix on medium speed until well-incorporated. Add the half and half, along with both the vanilla and almond extract and mix once more. Add the flour in 3 separate additions, mixing on low after each addition. Do not over-mix. Divide the dough into two rounds and lay each atop a sheet of plastic wrap. Flatten into a disk shape, wrap and refrigerate until chilled, no less than 1 hour. The dough can be made a day in advance. Preheat the oven to 350° and have ready cookie sheets lined with either parchment paper or a Silpat. One at a time, lay the disks atop a large floured work surface. Lightly flour each side of the dough round. Begin rolling, from the middle outward in each direction, shifting the dough slightly after each roll to avoid sticking. Do this until the dough is a 1/4” in thickness. Cut out dough into desired shapes. Transfer the cookies to the prepared cookie sheets, spacing them at least 1 inch apart. Bake until the outer edges are just tinged with golden-brown, about 8-10 minutes. Remove from the oven and allow to cool completely before icing. In the bowl of a stand mixer fitted with a paddle attachment, combine the butter and powdered sugar. If you do not have a stand mixer, use a large mixing bowl and a handheld mixer. Begin mixing on low speed, until most of the powdered sugar is mixed in, then increase the speed to medium-high. Mix until well-combined. Add the salt, extract and desired amount of food coloring (if using), and mix once more. Makes about 24 cookies and 1 1/2 cup of buttercream icing. And if you’re baking is in full-swing this Christmas, you might also consider making a few of these other spectacularly delicious Christmas cookies: buttery Mexican Wedding Cookies with Pecans, warm and cozy spiced Ginger Molasses Cookies, and the crowd-pleasing Strawberry Thumbprints. You can’t go wrong with any one of these recipes! These are so adorable!! Will be putting them on my Christmas make list! Hi there! Yes you can! However, cold icing can be difficult to spread, so be sure to set it out at room temperature for 45 minutes or so to allow it to soften up before decorating. Have fun with your cookies! How long can you keep these at room temperature given the butter in the icing? Hi Nancy! I usually keep these no more than 3-4 days at room temperature. If you’d like to extend the shelf life of your cookies, you can freeze them between sheets of wax paper in an airtight container for up to 3 months. They only need about 15 minuts on the counter to thaw. Enjoy your cookies! WOW…not in the Christmas spirit just yet, but I know it is just around the corner. I was just talking about starting to do Christmas shopping. Before we know it …. we will be right in the middle of making delicious cookies (and eating them too). Cant wait to get baking, the holiday season may not be too far away and these decorated sugar cookies are simply great! Very nicely done Kelly! It’s very easy to underestimate these cookies when it comes to baking them. Yours look perfect. And I really love your pipework. Great post! These cookies look so perfect and festive. Adding it in my christmas to do list. Thanks for sharing! I make sugar cookies with my grandma every year and we’ve never tried adding almond extract. Definitely going to test drive this recipe for Christmas this year! These are beautiful! These would be so much fun to make with the kids. I can’t wait to try these out. Its official. I am ready for Christmas baking! These look great! I’m not going to lie, the past few weeks, Christmas has been on my mind! Am I crazy or what? I cannot wait to start holiday baking, especially since it’s so hot here. Pinning these for later! I love sugar cookies in the holidays! Love how you have decorated these! Such pretty cookies! I already have cute little candy cane sprinkles to make these! Excited to make this for the holidays! Me too! Christmas is my favorite!!! It is never to early to plan out your Christmas cookies! I am going to be saving this recipe for the Holidays! Those mini candy cane sprinkles are adorable! I love how easy these look to decorate. I have not even started to think of Christmas baking (well that is not true). I have thought about it, and it stressed me out…so I stopped. I have started shopping….which will free up some time to bake. 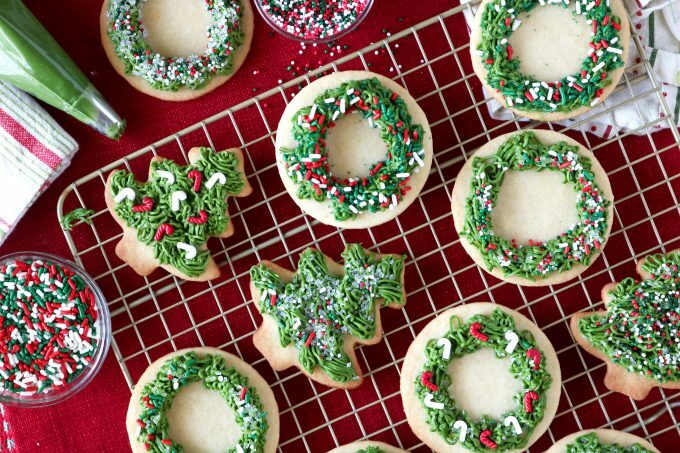 These look great, and would be awesome for a cookie exchange. Christmas baking is my favorite! I can’t wait to make these, they look perfect and I love a good Sugar Cookie!! When cookies and sweet treats (and candy) get too sugary – I’m out. These look just fantastic. And those small candy canes are so cute! These Christmas sugar cookies are great! Love how you decorated them to look so christmassy! Going to pin for later! Wow this is so nice. love the diff cookie decorations and so apt for the upcoming Christmas. I would love to try for my son. Thank you so much, Renu! Have fun decorating your cookies! 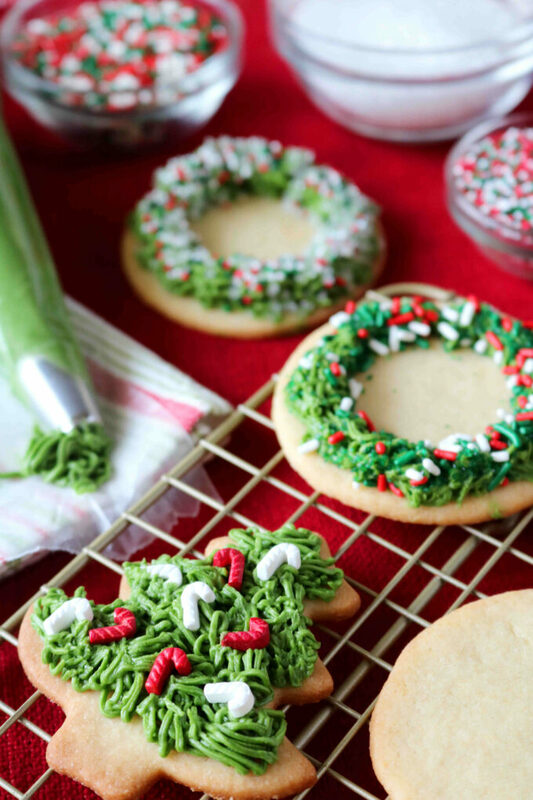 I love the grass frosting – I am definitely going to get that tip – great visuals on the cookies ! How cute are these cookies perfect for Christmas time and gift giving. I need to start baking love making cookies and do exchanges with other bakers. Your cookies are so beautiful! I usually ice cookies with royal icing and my bubs loves to help with the decorations but I will try buttercream as well this year. these are so festive and adorable. I love how each one is so carefully decorated. These really bring a smile on everyones face of joy! I love the effect on the Christmas cookies. So effective and pretty. I’ll have to give this a try. Wow, talk about sugar cookie goals!! The icing is perfect on these!!! These look so fun and festive, I love it! These little sugar cookies are so pretty for the Christmas holidays. Love your green frosting and piping style too. Kelly, this was truly a terrific and really helpful post, for so many reasons! 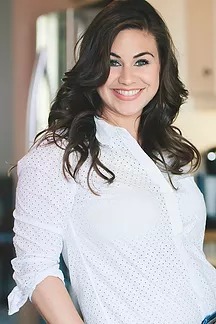 You’re absolutely right about lots of sugar cookie recipes being kind of “one note” – and now I’m so intrigued to go back through my recipe file and see how many of them don’t even include salt. That little addition, combined with almond extract (which I LOVE) is just sheer genius for boosting the flavor of the cookies! Plus – such great tips on making good frosting and on how to make it look so darn cute! Wonderful recipe and info – thank you – and merry, merry Christmas to you and your family! Those are the prettiest sugar cookies!! I love all your tips on how to make them the best! I’ve had so many sugar cookies and as you rightly said taste nothing but sugar. Who knew a bit of salt and almond extract could elevate it to the next level? 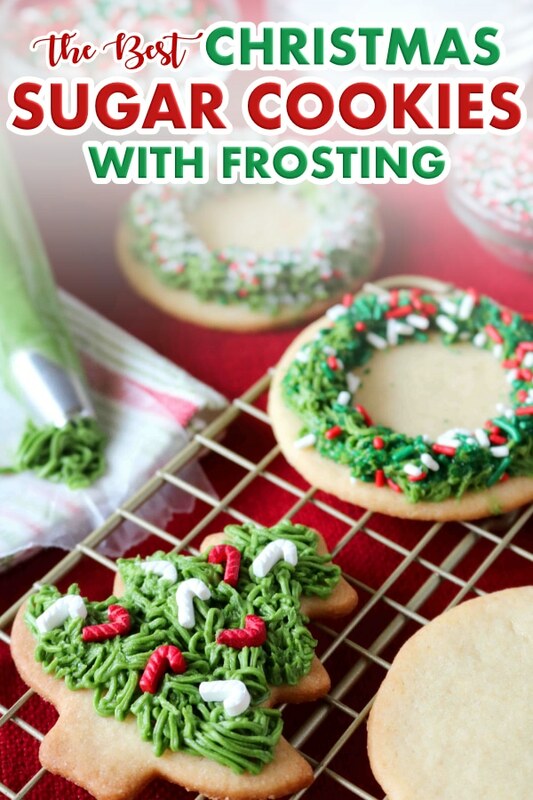 Love all the tips for frosting! These are so pretty, and look so delicious. My favorite cookies are actually these style, crispy cookie with fluffy, textured frosting. It’s the best. Cannot wait to make it. I love baking sugar cookies and these look so cute. I made a few Christmas trees this year. Hope to make more soon. These look so cute and I bet they taste amazing! Great tips too, you really make it sound so easy to make these. Will have to give these a try over the holidays. 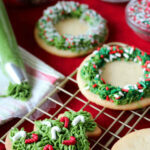 This are great suggestions for upping the sugar cookie game! Usually I am just so bored by sugar cookies and their lack of flavor so I’ll have to try out your suggestions! Thank you! GREAT tips in here! And I agree….almond extract makes a huge difference! Your frosting looks amazing! I”m going to give your recipe a try! Would the frosting hold well in a cellophane bag for a gift?